I read a handful of Terry Pratchett books several years ago, all from his Discworld series, but eventually left the Disc to go other directions. I never really knew much about the author until last year but have since become an even bigger fan. His books fall in the fantasy genre but they’re not your normal sword and sorcery books. 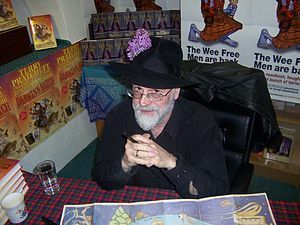 Pratchett is a tongue-in-cheek writer who adds comedy and satire throughout each book. The books read quickly but are ones that can be reread several times. You may catch something in a second reading that you hadn’t noticed the first time through. Pratchett loves to tie in characters from previous books, so familiar names will continue to pop up throughout the series. However, the best Terry Pratchett reading I’ve done has been of the interviews he’s given over the past few years. Pratchett was diagnosed with early onset Alzheimer’s in 2007 and has been open and honest about his reactions and life since. In no way could I do justice to the interviews he’s given, so instead I’ll include links to a couple of the better ones I’ve read. The last time I checked, the Discworld series stands at 39 books. 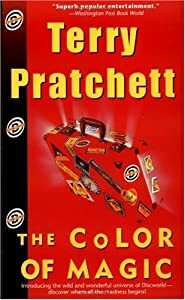 You can pick up any book in the series and read it individually, but like any world, Discworld has grown and evolved throughout the years so I recommend starting with the first and what I still consider one of the best – The Color of Magic – which I’m reading for the third time. Pratchett has touched many lives with his writing over the past 40 years and I’m sure he will continue to do so, in one way or another, for several years to come. I came across this post about entitled Things I Find in Books, Part 1. Give it a read. Like the author, I also tend to buy used books – in fact I can’t bring myself to buy a full priced book anymore thanks to Half Priced Books being so near. I’ve never found money in a book but I have been lucky enough to find a few random things in the well-worn pages of a few garage sale treasures, not including the faded brown boogers or questionable slightly curled hairs (I’m saying they’re arm hairs – that’s how I sleep at night). To me, the best items I’ve found have been a couple of personal letters from the 50’s and 60’s that were hidden within the pages of a couple of Goodwill bought paperbacks. There’s just something so intriguing about them. In a way, they’re quick snippets of that era’s reality T.V. Neither of them say anything monumental, but they both convey a level of courtesy, warmth, and love that is missing in most of the rhetoric. Plus the penmanship of both, while the two are completely different, speaks to a time where style and readability were equally important. Looks like I’ll be stopping by Goodwill tomorrow to browse the selection.